This weekend’s mad dash into holiday (and otherwise) fun is all that’s merry and fright. T Bone Burnett-approved holiday sing-along? Check. Extraterrestrial (not the baby Jesus) pastries? Check. This weekend, welcome to the weird side of Wonderland. X-philes longing for more fan fuel for their fave obsession hobby will want to sidle over to the NerdMelt Showroom at Meltdown Comics this Friday for the opening night of The Truth is Out There: An Artistic Exploration of The X Files. Yes, you want to believe. 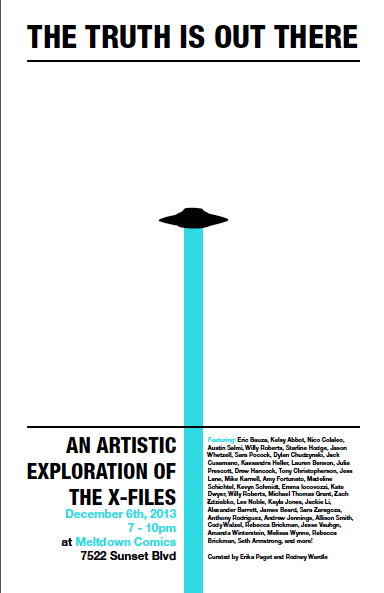 The FREE art show, which features 50+ artists interpreting Scully, Mulder and their out-of-this-world nemeses, runs through December 12 but you won’t want to miss the themed cocktails, extraterrestrial pastries and the “very familiar photo booth” at the first night bash. Fingers crossed for a Great Mutato martini and a flaky Flukeman cookie. When You’ve Been Very, Very Bad…. With the imminent arrival of the punitive LA Krampus Troupe and the paganistic, multi-event Krampusfest, you may want to think way beyond milk and cookies as Christmas bribe if your personal slate tips heavily in the direction of slacker, sot, and slattern. Started in the 17th century and originating in — where else? — the Grimm Brothers Ground Zero of Eastern Europe, the Krampus tradition makes you understand the impetus, misguided or not, to tidy up Christmas. First, swap out Mr. Claus with the benevolent but decidedly un-jolly Saint Nicholas. Next, replace Santa’s hyper-happy elves with huge, horned, shaggy demons. 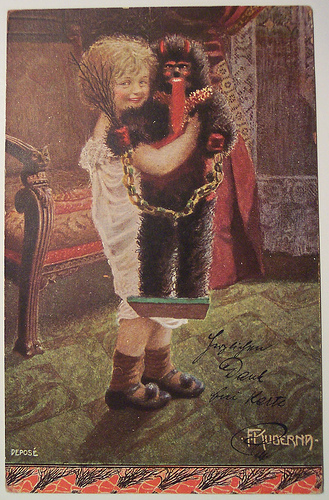 Finally, forget the bag of North Pole toys; the Krampus carries a basket so he can kidnap pint-sized miscreants and take them off to hell. Another child brainwashed to love Krampus. Want to go where the wild things are? This Saturday, mingle with monsters — in costume if you wish — as Krampusfest kicks off with the Krampus Ball at The Set Shop, a prop house re-purposed as beastly lair crossed with Alpine party pad. Not only will the LA Krampus Troupe raise a ruckus, there will be themed music including cabaret, rock, and Bavarian folk. Timur and the Dime Museum does a turn as Santa Klaus Nomi and Lux and Ivy-inspired The Kramps will perform “bad music for bad children”. Glutton for punishment? Head downtown for next Thursday’s December 12th Art Walk; St. Nick’s monstrous enforcers will roam the streets in a traditional Krampuslauf (i.e. Krampus walk) terrifying delinquent adults (but no children) with switches instead of candy canes, chains instead of spruce garlands, and clanking cowbells instead of jingle bells. This is not the time to say “More cowbell”. For an artistic take on the inherent voyeurism of Santa spying on good girls and boys, head to the Copro Gallery in Santa Monica on September 14 for an outdoor Krampus performance and the Naughty or Nice group exhibition featuring Tim Burton and other artists. Funny, a lump of coal doesn’t seem so bad after all. It’s hard to resist the charms of a holiday choir and the Angel City Chorale is guaranteed to warm the heart of even the most curmudgeonly Scrooge with Joyful! 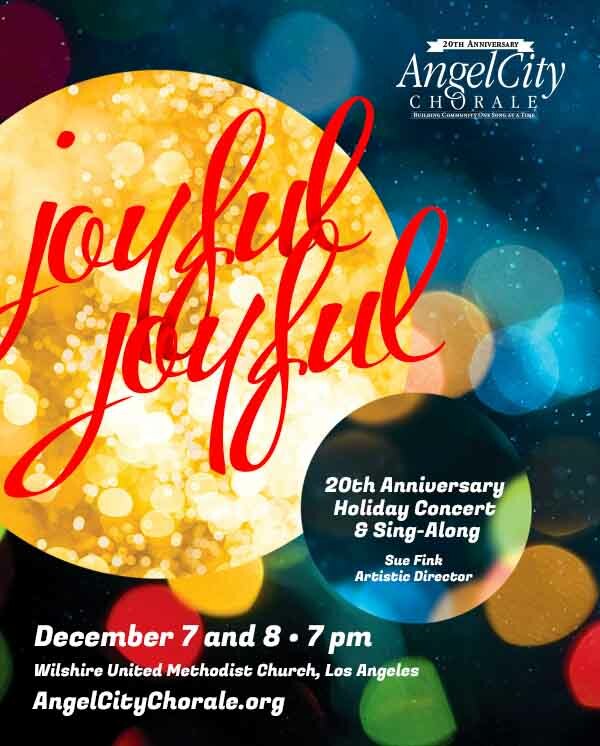 Joyful!, their two-night, 20th Anniversary Holiday Concert & Sing-Along taking place this Saturday and Sunday at the historic Wilshire United Methodist Church. Conductor and Artistic Director Sue Fink started ACC at McCabe’s Guitar Shop in 1993; the 18 person choir has since grown to a multicultural, 160-member chorale known for its diverse selection of musical material including classical, jazz, folk, gospel, and rhythm and blues. On December 14, Angel City Chorale walks the season’s talk with their Tour of Hope. With the intention of “building community one song at a time”, ACC performs annually for audiences of the homeless, the elderly, and others most in need of holiday spirit. Over the past 15 years, Angel City Chorale has performed for over 30 service organizations. Go Go’ers, that’s a lot of musical love.